Pauley is the recipient of multiple Emmys, the Walter Cronkite Award for Excellence in Journalism, the Edward R. Murrow Award for outstanding achievement and the Gracie Allen Award from the Foundation of American Women in Radio & Television. Pauley joined “CBS Sunday Morning” in 2014 as a contributor and substitute anchor. Highlights of her work on the broadcast include a profile of Hillary Rodham Clinton; a moving interview with 11-year-old Marquis Govan, who became a voice of reason in the aftermath of the Ferguson, Mo., shooting of an unarmed man by a police officer; the only TV interview with David Letterman about his retirement from late-night television; and a report on a group of educators who lived through the shooting at Sandy Hook Elementary School​ in Newtown, Conn., who are now fighting to change gun control laws. Before joining CBS News, Pauley was a familiar face on morning, daytime and primetime television. She began her network television career in 1976 as a co-host of NBC’s “Today” show. She spent 13 years on the morning broadcast, and a decade as the anchor of “Dateline NBC,” starting in 1992. 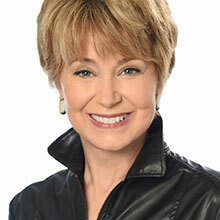 She was the host of the syndicated daytime series, “The Jane Pauley Show,” in 2004. Pauley has written two New York Times bestsellers: A memoir, “Skywriting: A Life Out of the Blue”​ (Ballantine Books 2004); and “Your Life Calling: Reimagining the Rest of Your Life”​ (Simon & Schuster 2014), based on her award-winning series on “Today” about people age 50+ starting different careers, learning new skills, making a difference or pursuing their dreams. A longtime advocate in children’s health and education, Pauley is also a highly-regarded spokesperson in mental health. She and her husband, “Doonesbury” cartoonist Garry Trudeau, are the parents of three grown children and grandparents to two.